Researchers are making increasing use of remote access to the macromolecular crystallography beamlines at the Australian Synchrotron.The remote access capabilities of the MX1 and MX2 beamlines mean that users can control their beamline experiments from their home laboratories – or even the passenger seat of a car. Almost one in four researchers with beamtime in the first cycle of 2013 used remote acess, up from 11 per cent in 2011. Remote access has also been employed to good effect by commercial users. 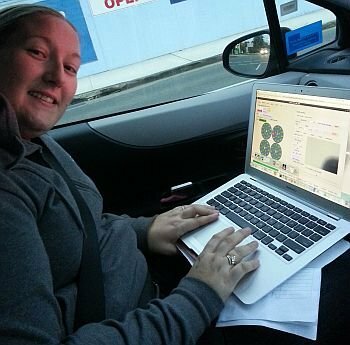 Dr Stephanie Gras from Monash University took the idea one step further in June 2013, logging into the MX2 beamline to collect data while travelling between Brisbane and the Sunshine Coast in a car driven by her husband. An ARC Future Fellow with the university’s Department of Biochemistry and Molecular Biology, Stephanie is studying viral immunity. The Australian Synchrotron allows her to see the atomic details of immune system proteins involved in antigen recognition. International competitive pressure on a collaborative project between the Rossjohn laboratory at Monash University and the Godfrey laboratory at the University of Melbourne – involving the recognition of lipid-based antigen by the human immune system – persuaded the Monash group to maximise their beamtime by using remote access in a car while travelling in Queensland, using Stephanie’s iPhone as a WiFi hotspot. Thank to the data collected during that time, the research collaborators – from both universities – were able publish their results in Nature Immunology. Remote access is possible for users of the MX1 and MX2 beamlines at the Australian Synchrotron. More information is available on the MX FAQ webpage.